External compression therapy has been used since the 1960s to enhance the body’s natural circulatory and lymphatic systems. Initially, when Dr. Laura Jacobs developed NormaTec Dynamic Compression the system was used primarily for those types of medical issues. She discovered that, while NormaTec dynamic compression sleeves are excellent for improving those medical conditions, they also help improve athletic recovery and performance. An added bonus is that they help cosmetic appearance and health. The Normatec dynamic compression system can be compared to receiving a massage. The NormaTec system utilizes sequential pulsing of compressed air that massages, mobilizes fluid and evacuates lactic acid, inflammation, fat and other byproducts. The system uses three techniques to facilitate this process; pulsing, gradients and distal release. Sequential pulsing essentially mimics the muscle pump of the legs and arms moving inflammation, fluid, fat and metabolites out which is key in healing after an intense workout, surgery, disease, or cryotherapy. The sequential pulsing is divided into 6 zones to create a pressure gradient; the system uses a “hold pressure” technique that keeps fluids from being forced back in the wrong direction. The sequential pulse technology releases the hold pressure so the limb gains maximal rest time between compression cycles. Kori Kryotherapy offers the NormaTec system attachments for legs, hips, arms, and shoulders. The risks are equivalent to those associated with a standard massage. The intensity and duration of treatment are set based on the needs or desires of the client. Sessions start at 35 minutes. Why Compression Therapy After Cryotherapy? Kori Kryotherapy recommends that NormaTec treatment is administered after cryotherapy to maximize the full benefits. NormaTec can be used prior to physical exertion to enhance performance. The compression warms muscles and improves flexibility thus preventing injury. Utilizing NormaTec after physical exertion helps improve recovery time allowing for more intense training and less pain. 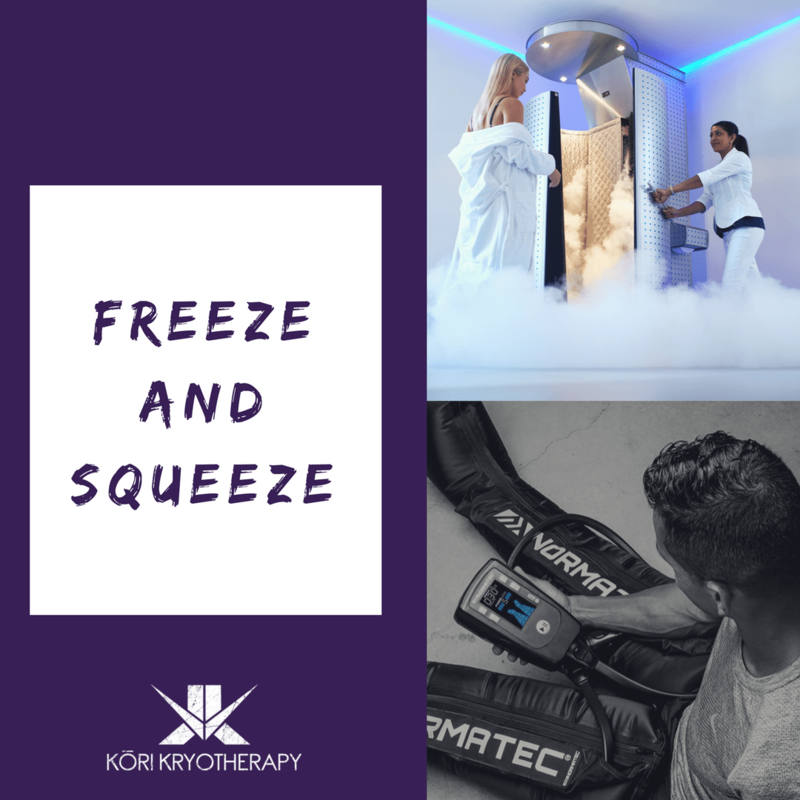 Kori Kryotherapy offers NormaTec as a stand-alone treatment or combined with cryotherapy. It is our recommendation that NormaTec is used after cryotherapy to enhance the benefits of NormaTec. Cryotherapy mobilizes inflammation in the body. When the body is exposed to extremely cold temperatures it causes vasoconstriction which physically pumps inflammation out of blood vessels, muscles and tissue. Cryotherapy also stimulates an anti-inflammatory biochemical response which reduces inflammation at the cellular level throughout the body. Both of these actions mobilize inflammation from cells throughout the body. NormaTec compression will facilitate the evacuation of this inflammation through the lymphatic and circulatory systems. Cryotherapy and NormaTec compression are a powerful combination significantly enhance the effects of cryotherapy treatment. Who and what medical issues can be treated with the use of NormaTec Dynamic Compression? 8. Chronic, non-healing Wounds and/or Cellulitis. 11. Post-operative patients looking to Accelerate Recovery.